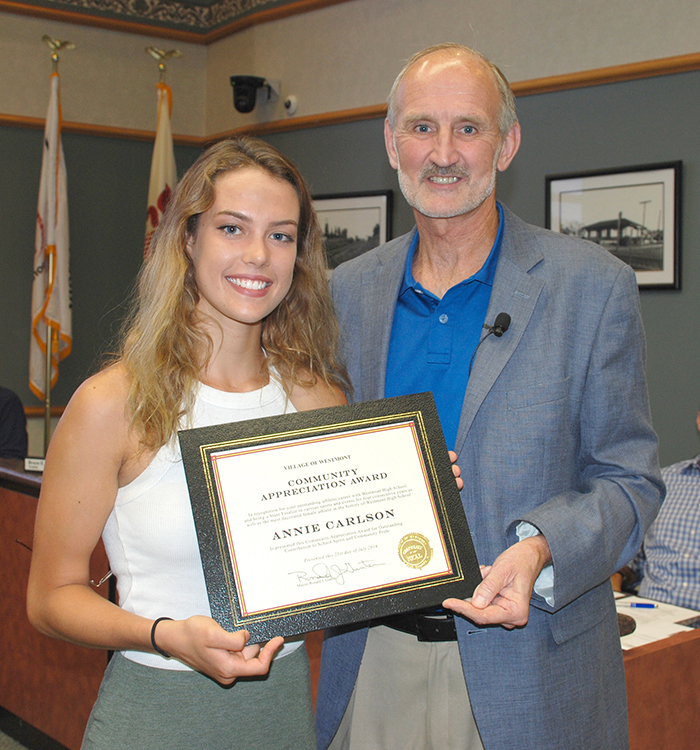 At the July 21, 2016 Board Meeting, Westmont High School athlete Annie Carlson was honored by Mayor Ron Gunter and the Village Board for her amazing accomplishments during her four years at Westmont High School. In basketball, Carlson was a four-year varsity starter and scored over 1000 points during her high school career. Over her four years, she averaged 13 points and 10 rebounds per game, and scored a double-double in every game for her last two seasons. Carlson was all-conference. In track and field, Carlson broke a total of 10 records at WHS. She holds five indoor records and five outdoor records including records in the 100m and 200m dash, 55m and 300m hurdles, long jump, and triple jump. As Westmont’s only State-qualifying track and field athlete over the past two years, Annie single-handedly placed Westmont in the top 10 two years in a row. She earned a total of nine all-state medals during her WHS track and field career. Additionally, Annie was an exceptional student and graduated Westmont High School with 21 college credits under her belt. She also earned the Presidential Merit Award. Annie has earned a track and field scholarship and will be attending Colorado State University this fall. The Village of Westmont congratulates Annie on all of her accomplishments and wish her even more success as she continues to compete in the future.